John Flanagan is the Australian author of two popular fantasy series titled Ranger’s Apprentice, Brotherband Chronicles, and a crime mystery series titled Jesse Parker Mystery, which currently includes two books. Probably the John Flanagan Ranger’s Apprentice is the author’s most popular series and the one that most readers associate with him. The series which also has a short spin-off involving The Early Years. A newer companion series is the John Flanagan Brotherband series, which currently includes seven books. Here are the John Flanagan books in reading and chronological order for his fantasy and mystery series. John Flanagan was born in 1944 in Sydney, Australia, where he also grew up. The author attended the attended Waverley College, with the hope that he would become an author. In fact, he always wanted to be a writer, however, his dream started to take hold after he wrote a rather insulting poem about a manager at the company he worked at when someone noticed his talent and offered to teach him copywriting. John remained in the advertising business for two decades, after which he teamed up with a friend to write a script for a TV series titled Hey Dad! The sitcom aired for 8 years. He wrote 293 episodes for this TV sitcom. In addition, he also wrote scripts for two additional TV comedy sitcoms Hampton Court and My Two Wives. When John Flanagan started writing his first young adult fantasy series, The Ranger’s Apprentice, he wrote it for his son, Michael, to encourage him to read since Michael didn’t like to read books, however, soon, the series became popular all over the world, so now the author is still working on the series, while he also started two additional ones, one in the fantasy genre and one in the crime mystery genre. Before writing fantasy novels, his first attempts, when he was 19, were thriller novels, manuscripts which he eventually threw out. He initially started to work on his Ranger’s Apprentice series back in the 1990s when he first wrote 20 short stories. His son, Michael, was at the time 12. Eventually, John included those initial short stories in the series’ first book, The Ruins of Gorlan, a book which published in 2004, when the author was 60. As the series became popular all over the world, it gradually was sold over 8.5 million copies in 27 countries so far. The author John Flanagan received the Australian Publishers Association’s Book of the Year for “Older Children and the International Success Award” for his book Erak’s Ransom, the seventh in the Ranger’s Apprentice series. The Ranger’s Apprentice world is set in a fictive 12th Century Medieval England, and it focuses on a young man called Will. John Flanagan based Will on Michael and he would make him do things that Michael would do as well, so he would feel a kinship with Will. The attempt was a success, as Michael started reading the short stories. The Ranger’s Apprentice has been optioned for the big screen and it’s currently in development. The film is being backed by a Chinese company called Film Carnival, who finances it for at least $500 million. 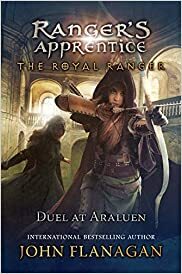 The Ranger’s Apprentice has come to a conclusion, but currently, the author John Flanagan is working on his next series, the Brotherband Chronicles. The latest book in the series is called The Caldera, published in 2017. The book also includes a bonus short story featuring the two main favorite characters, Will and Maddie, from the Ranger’s Apprentice series. The new series, Brotherband Chronicles, is a spin-off from The Ranger’s Apprentice, but it can stand well on it own and the previous series doesn’t need to be read in order to understand this new one. The Brotherband Chronicles series features Stieg, a half-Skandian, half-Araluan boy who designs a radically new type of ship. The series takes often place in treacherous waters where Stieg and his crew of Herons battle pirates and save people. In The Caldera, the Herons and Stieg are back to battle pirates on stormy seas in order to rescue the kidnapped son of an empress who was kidnapped by the pirate Myrgos. As John A. Flanagan, the author also writes a crime mystery series titled Jesse Parker. It focuses on Jesse, an ex-Denver police detective, who returned home to Steamboat Springs, Colorado, who ends up helping the town sheriff with his cases involving brutal murders. While the other John Flanagan books are young-adult fantasies, this new series is an adult, contemporary series. Currently, John Flanagan lives with his wife, Leonie, in Manly, New South Wales, a beach suburb of Sydney with his son, two daughters, and four grandchildren. He is working on his next book.